The Aisawan Resort & Spa. A walkway to the ocean. A short journey that will be remembered for a life time. The Aisawan Resort & Spa is located upon quiet and private Wongamart Beach with a tranquil backdrop of lush tropical gardens near Pattaya. 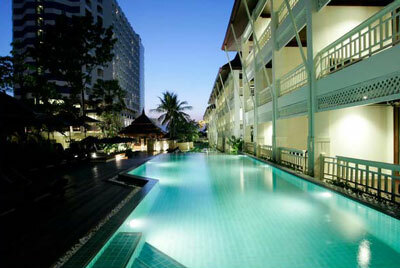 One of Thailand most established resort destination. A new,classically styled entrance of marble,sandstone and slate leads the way to a sumptuous lobby and recepption area with its own relaxing Piano Bar. Aisawan Resort & Spa provides various accommodation options, designed to suite the style and budget requirements of its guests. From the fully equipped room Superior rooms through to the executive Royal Suite, featuring its own sauna and jacuzzi, Aisawan Resort & Spa proudly guarantee excellent level of service and standards that are unique to the area. The resort features the totally refurblished large full seaview Aisawan Club rooms. With bathrooms that look out to the sea, polished redwood flooring and walls of silver leaf behind silk covered beds,these room simply ooze luxury and style. Close to the spa are the Garden Villas,individual chalets that capture the feeling of being at one with nature. Conference & banqueting: 5 meeting and function rooms and a Grabd Hall offer full facilities for conference and parties of any kind or size. A newly built Kids Club is at hand to ocuppy children, allowing parents wishing to relax,enjoy a variety of water sport or perhaps venture into town for a little shopping. Fitness: A well equipped fitness area overlooks the Aisawan Resort & Spa,and a modern business centre keeps the outside world close to your fingertrips. Aisawan Spa: The Aisawan Spa features a unique reception area with a direct walkway to the ocean,passing a series of massage,jacuzzi and treatment sales on the way. This is the only resort in the area affording a spa experience that greets its guests with breezes of fresh sea air. Fine dinning is always close to hand at Aisawan Resort & Spa. The excellent Terrazzo restaurant,with marvellous views of the ocean,offers a varied menu of Thai and international dishes,and provides a popular buffet. Featuring live music and barbeques every evening, the Terrazzo is a popular choice,particularly for families. For those with luxury in mind look no further than the superb Bay Leaf Fine Dining Room. Aircondition and stylishly decorated,Bay Leaf offers an a-la-carte menu of sumptuous dishes,accompanied by and exclusive selection of wines. The Patio poolside cafe and coffee shop complete a wide choice of dining options. Situated poolside,the Patio restaurant offers and informal menu to suite those who seek a little shade from the sun during day,and relaxed eveing atmosphere later on as guests enjoy cocktail after sunset accompanied by the cool breez from the ocean. The Patio also provides a perfect setting for private parties with a varied selection of function rooms,mostly overlooking the ocean and capable of catering for up to 250 guests. Aisawan Resort & Spa has two swimming pools with a poolside bar. For those who prefer the beach, the Resort has its own,the only private beach in Pattaya.